Mount Vernon’s restoration efforts aim to represent the estate as it appeared in 1799, the last year of George Washington’s life and the culmination of his designs for Mount Vernon. Mount Vernon is one of the best documented and most complete examples of an estate from early America, but discovering, analyzing, and interpreting the extraordinary mass of available evidence is an ongoing process. 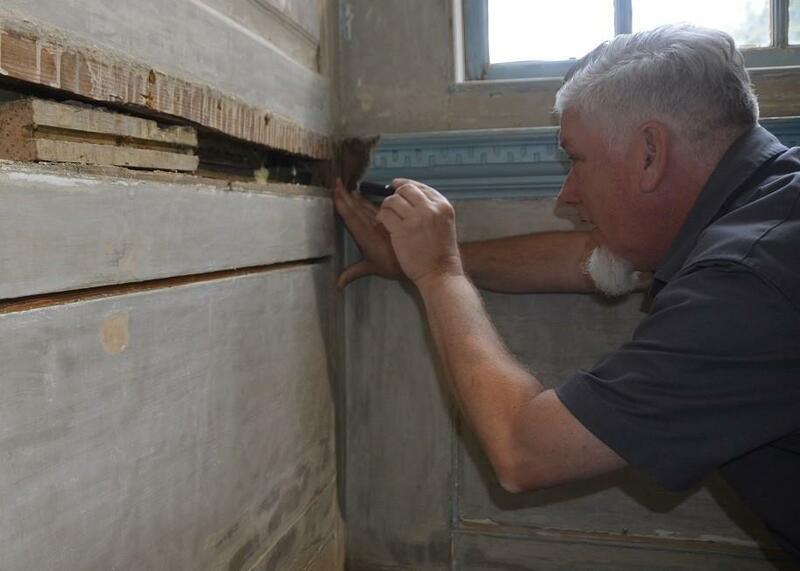 The restoration of each room in the Mansion and each outbuilding is accomplished through the collaboration of experts in multiple fields, including architectural historians, archaeologists, carpenters, curators, conservators, and collections managers on Mount Vernon’s staff and craftspeople and colleagues from other historic sites. As new documents and artifacts come to light and technological and analytical tools advance, we continually refine our understanding of Mount Vernon in order to give visitors accurate and engaging views of the past. The Mansion, outbuildings, and furnishings offer powerful testimony to where Washington came from, who he became, and the people and influences that shaped him, as well as tangible connections with life in the 18th-century Chesapeake region. 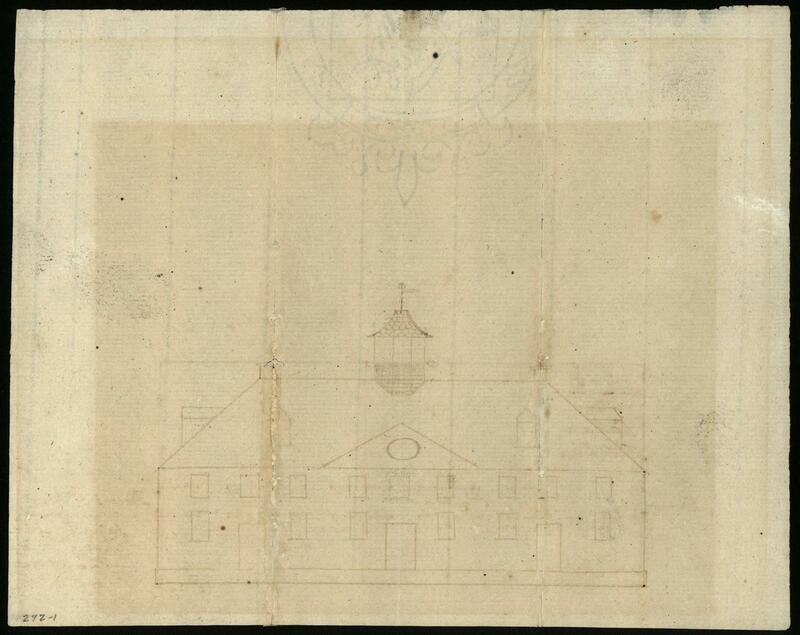 West Elevation Plan of Mount Vernon, c. 1774, George Washington, MVLA. Prior to the start of a restoration project, Mount Vernon’s architectural and curatorial staff examine available documentary, visual, physical and artefactual evidence. The documentary evidence includes tens of thousands of personal papers from the Washingtons and their contacts: letters and diaries, invoices and receipts, and financial accounts. While the majority of these papers are now at the Library of Congress, many are held at the George Washington Library as well as other repositories throughout the world. Verifying, transcribing, and digitizing these documents is the ongoing mission of the Papers of George Washington project, begun in 1976 and continuing to this day. The writings of Washington’s contemporaries, the records of associated merchants and craftsmen, and visitors’ accounts of Mount Vernon are also reviewed. The probate inventories taken after George and Martha Washingtons’ deaths provide key information about the arrangement, function, and furnishing of the house in the Washingtons’ later years. 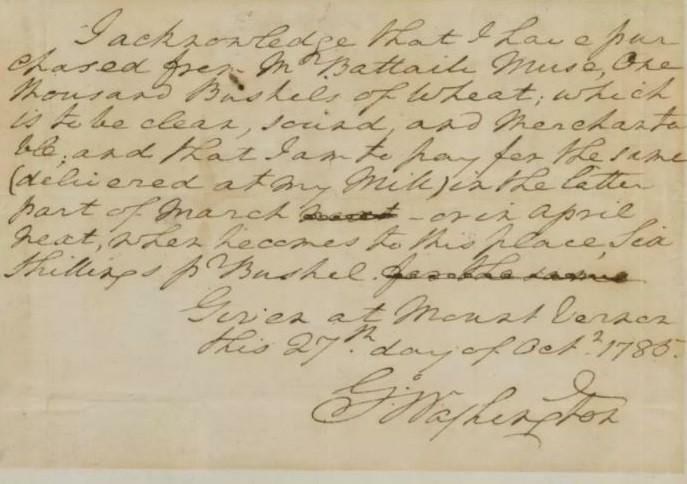 The probate inventories of Mount Vernon residents who came before and after George and Martha, such as those of Lawrence Washington and Bushrod Washington, provide comparative insights. Finally, examination of documents from the 19th century onwards helps us to understand changes that have impacted the estate over time. Receipt from George Washington to Battaile Muse, October 27, 1785, Gift from the Jess and Grace Pavey Fund, 2005, MS-5783. A picture is worth a thousand words, as the old saying goes, and visual sources provide further evidence. These include period pattern books for architecture and furnishings, as well as drawings, prints, and paintings that enhance our understanding of period building and furnishing practices or simply help us envision how a building or landscape appeared to an 18th-century visitor. The few surviving early views of Mount Vernon provide benchmarks of changes to the exterior and the landscape design. Photographic images of Mount Vernon from the 19th century and later also enable us to identify when physical changes were made to the Mansion. Evaluating the physical evidence, or material culture, begins with the Mansion and other original buildings, identifying and dating different architectural features, such as woodwork, plaster, masonry, flooring, framing and even wallpaper fragments. 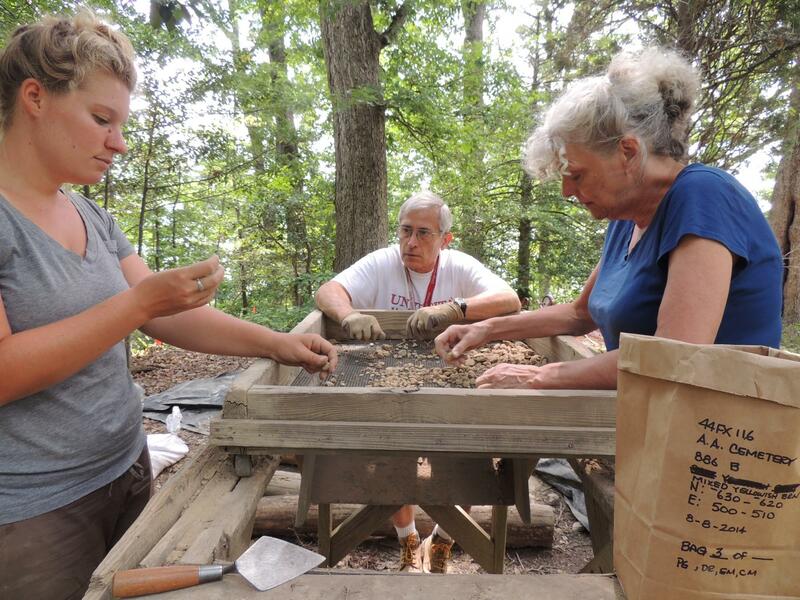 Archaeological findings are reviewed and compared with documentary evidence for furnishings and materials used at Mount Vernon, and surviving decorative arts objects with Washington histories, from chairs to fabrics to table wares, are analyzed to understand who, when, where, and how they were used. Marking nails in the floor of the Blue Room, MVLA. The Architecture Team, consisting of architectural historians, architectural conservators, preservation specialists and carpenters, leads the investigation and restoration of the estate’s physical fabric. The team analyzes documentary and physical evidence in tandem, with the goal of representing the architectural landscape consistent with the estate’s 1799 appearance, conserving and protecting existing 18th-century architectural elements, and creating a thorough archival record for future generations. As each project progresses, theories and documentation are continually revised to reflect the ongoing synthesis of evidence. Based upon documentary research and preliminary physical investigation, a research design and a preservation plan are developed. The research design memorializes not only the background research but also, taking into account the preliminary physical investigation, articulates the outstanding research questions pertaining to the space. The preservation plan details the most appropriate restoration of the space, identifying areas for repair, preservation, and conservation and the methods by which those areas will be addressed. Investigating with a flashlight inside the south wall after the removal of the chair rail. MVLA. Physical investigation utilizes a variety of methods and instruments, some as basic as raking light from hand-held flashlights, to identify early tool marks or repairs, or magnets to find metal fasteners hidden underneath paint and putty. More advanced technology can include a thermal imaging camera or an endoscope attached to a tablet computer, to non-destructively examine framing elements behind walls or under floors. We also undertake microscopic analysis of paint, plaster, and wood to determine the material composition and generations of change. To the extent that architectural fragments must be removed from a space, either due to degradation or for added protection, they are accessioned into the Architectural Study Collection, ensuring that these objects are cared for to the highest standards in perpetuity. 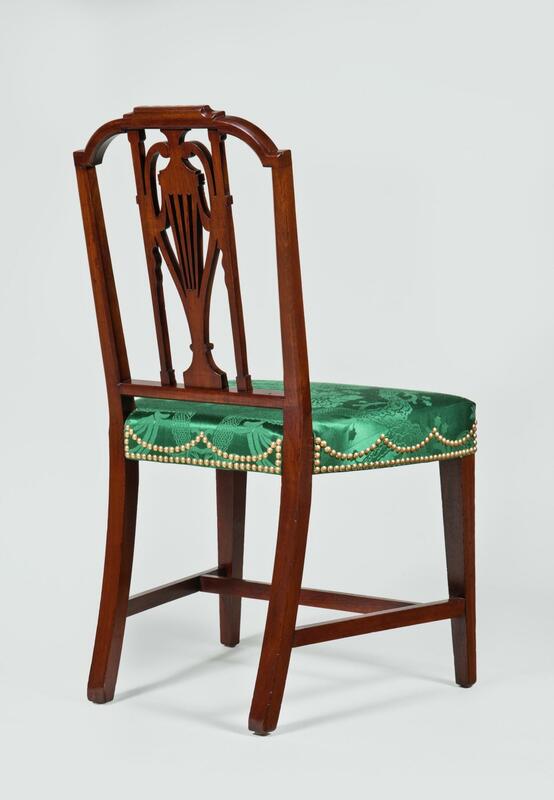 Aitken side chair, John Aitken, 1797, Purchase, 1998, Conservation courtesy of Mrs. John F. Bookout, III, Vice Regent for Texas, in honor of Mrs. Richard W. Call, former Vice Regent for California, W-2820. The Curatorial team, consisting of curators and object conservators, leads the investigation and installation of furnishings in the Mansion. 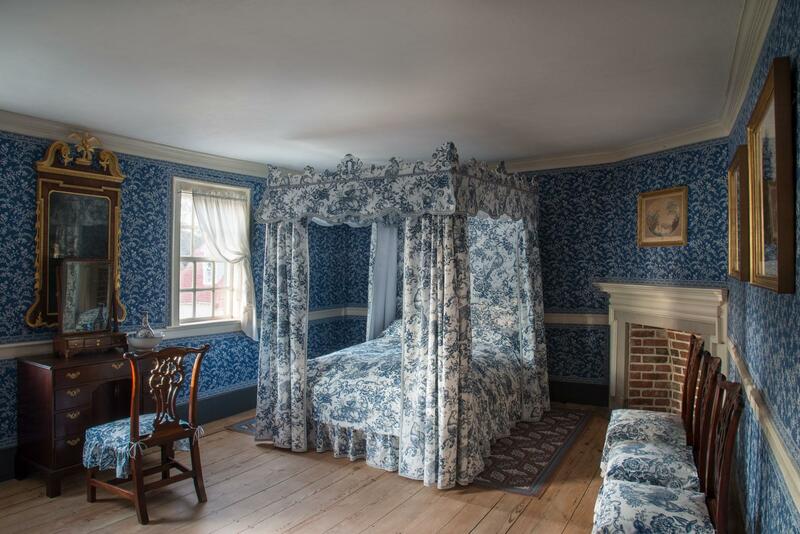 We aim to show how the furnishings of a room appeared in 1799 and to do so in a dynamic way that allows visitors to understand how the people of Mount Vernon used and related to these spaces. With each restoration project, curators develop a furnishing plan based on analysis of all the available evidence, from surviving furnishings, archaeological artifacts, and documentary and visual sources. 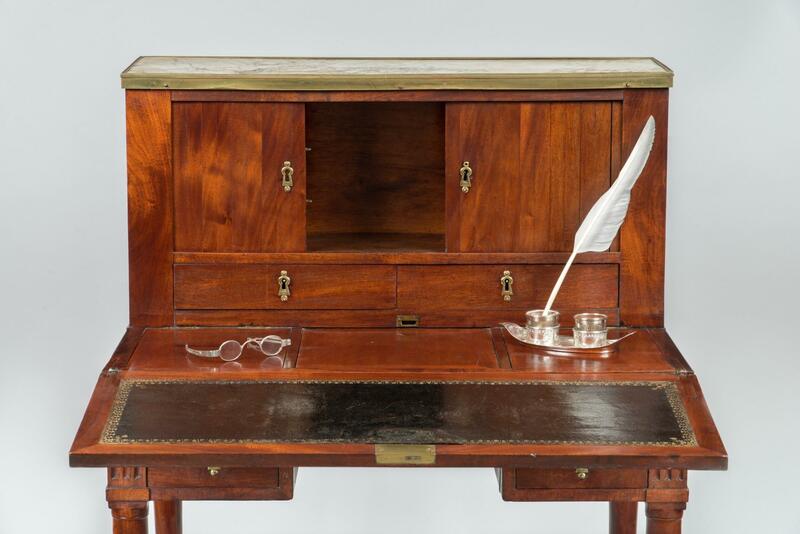 To support this work, we created the Washington Material Culture Database, which allows us to assemble and track all the documentary references to movable goods and building materials owned and used by the Washingtons. We can then analyze this information to understand how Mount Vernon and its interiors changed over time, quantifying the Washingtons’ consumption of goods, and identifying trends in acquisition and use, as well as significant shifts in their consumer habits. 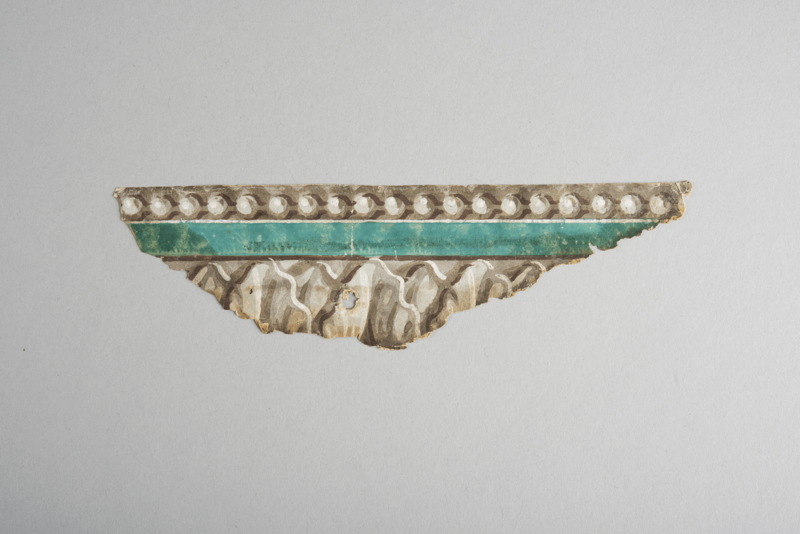 Fragment of wallpaper border used in the New Room at Mount Vernon (W-1482/A). The fragment corresponded to a design offered by Réveillon/Jacquemart et Bénard, indicating that Washington was buying French papers for Mount Vernon in the 1790s. Working with conservators, curators examine original Washington-owned objects, analyze materials, and use imaging technology to see inside or below surfaces, all to understand how they were made, used, and may have appeared to the Washingtons. When an object is selected for display in the Mansion, conservators stabilize, clean, repair, and/or restore it in order to ensure its long term preservation. Collections managers ensure that objects are cared for to the highest standards with the goal of their survival in perpetuity. In the course of a restoration project, the collections managers ensure that all furnishings, objects, and artwork are carefully handled, stored, and installed, and that the condition of all items is continually monitored. 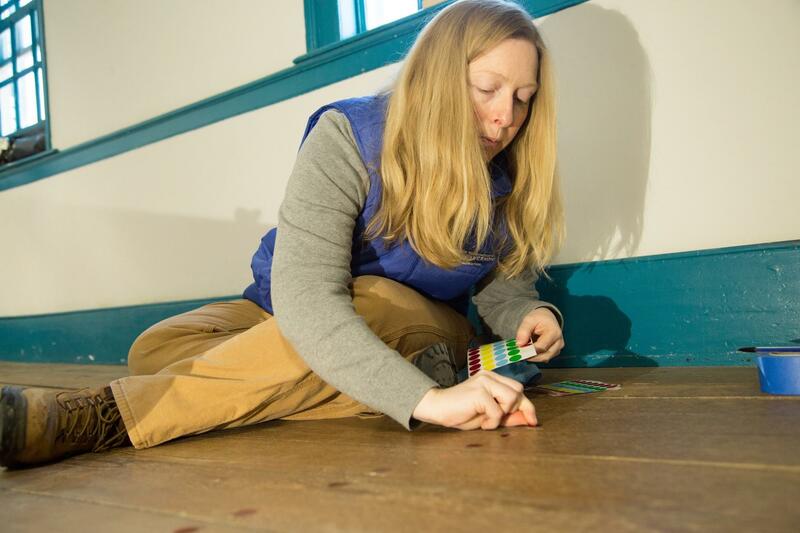 This work may involve physically going off-site to pick up objects recently acquired or conserved or arranging the shipment of objects to and from Mount Vernon. Once an object is on-site, it is our responsibility to manage the legal paperwork involved to guarantee everything is fully documented. We also collaborate with the other teams to devise creative solutions to make sure that objects are exhibited in the safest, most secure way possible without detracting from the historical accuracy of a room installation. 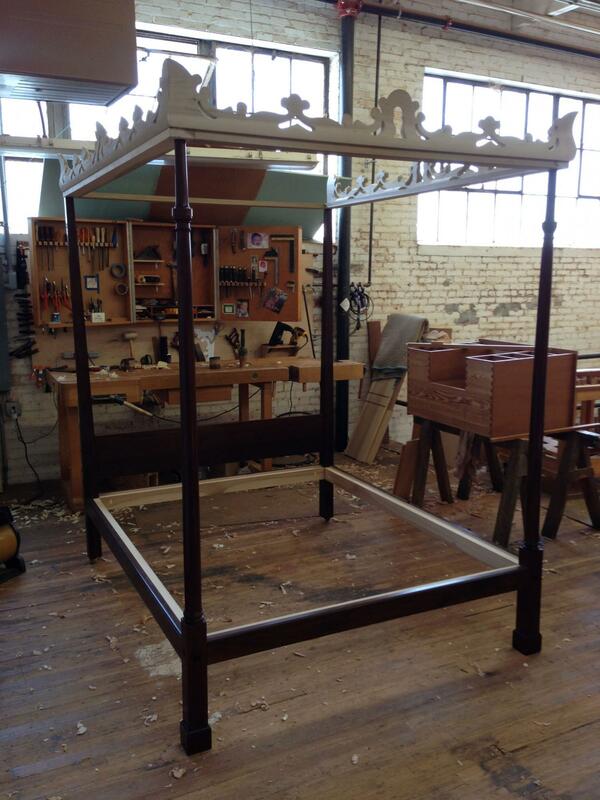 The reproduction dressing table, in progress, sits on the workbench to the side of the completed reproduction bedstead for the Blue Room. Courtesy of Harrison Higgins, Inc., Richmond, Virginia. Within the Mansion, each room installation typically features a combination of original artifacts, period objects, and thoroughly researched reproductions. Considerations of condition, visibility to the visitor, and security are weighed when deciding what goes on view. The original Washington artifacts are the treasures of the collection, and in each Mansion room we strive to bring as many original objects back on view as possible. When original objects have not survived or cannot be located, when they remain in collections outside Mount Vernon, or are fragile, the curators identify ways to best represent them in their absence. When we have a general, but not specific, documentation of an object that was relatively common in the Washingtons’ period, we seek a period object to represent it. When detailed descriptions of original Washington objects survive (even though the object itself does not) reproductions can serve to represent the unique pieces that the Washingtons owned. We then work with craftsmen to meticulously recreate a missing object based on the original specifications. Textiles and paper-based prints and drawings are among the objects most prone to damage from exposure to light, so we use reproductions of these items in the Mansion. The originals are preserved in controlled storage and made available for study as needed. 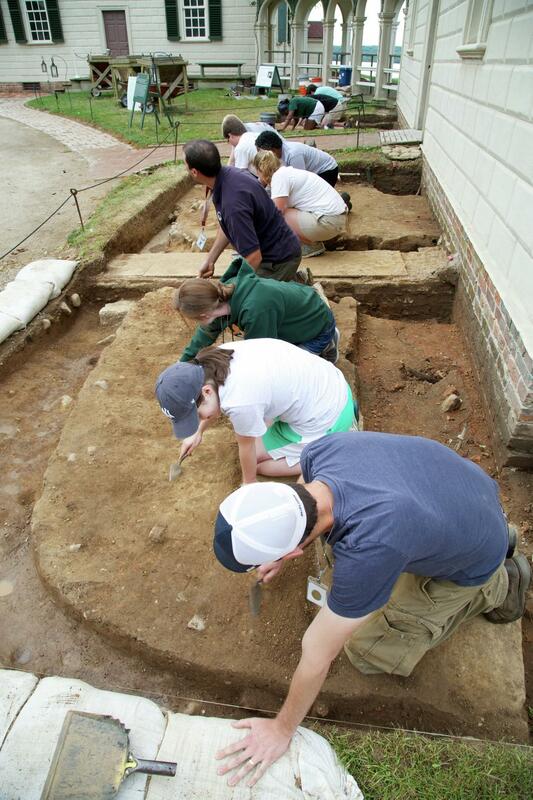 The Archaeology team contributes to our understanding of how the Mansion and outbuildings were constructed, furnished, and used, through ongoing archaeological excavation and analysis of existing collections. Every foundation that is laid, every planting hole that is dug, and every piece of trash that is discarded has the potential to leave an archaeological trace, whether in 1799 or today. It is this complex puzzle of deposits over time that our archaeological field crews slowly tease out through careful and detailed excavation and documentation. Results of this work can include the discovery of undocumented structures, relative chronologis of construction and alteration of the Mansion and outbuildings, and even evidence of how interior and exterior spaces were used by the plantation community. Combining this evidence with that derived by our architectural colleagues, archaeology contributes to decisions concerning the appearance of the structures and landscapes of Mount Vernon in 1799. Slave cemetery excavation, MVLA, 2014. Archaeological evidence also includes the analysis and curation of artifacts recovered from excavations. Our archaeologists employ techniques as varied as X-ray Florescence, UV light, microscopic inspection, and comparative collections to identify objects by examining their material composition, manufacturing processes, and evidence of use. These techniques are employed on objects as diverse as architectural elements, ceramic and glass household tablewares, items of personal adornment, and dietary remains. Through these techniques we can explore questions related to when, where, how and why objects were used in the everyday lives of the free and enslaved individuals who formed the Mount Vernon community of 1799. Such work, in conjunction with our curatorial colleagues’ research, contributes directly to the development of furnishing plans for our restoration efforts. The Blue Room after its 2017 restoration work, MVLA. Once restoration has been completed the teams produce final documentation and develop public-facing content for various media outlets, working closely with the Marketing and New Media teams. The teams also work with the Visitor Engagement team to make a seamless transition in educating and reopening the restored spaces to visitors. The restoration of Mount Vernon is a collaborative effort that uses the best available tools, research, and intellectual capital to show how Mount Vernon appeared in the Washingtons’ day. Each restoration project builds on the research and work of previous generations. There is still much that is yet to be learned, and we are committed to restoring Mount Vernon to the highest standards of authenticity, in order that future generations may continue to enjoy and learn from this unique site.